Perform the exercises in this circuit one after another resting for the specified time period between each exercise. Repeat the entire circuit for 15 minutes. The bench push-up is a beginner upper body exercise. This is an excellent compound exercise that targets the chest shoulders and arms. The tricep dip with the Bosu is an intermediate upper body exercise. This exercise targets the triceps and is the progression to the tricep dip on the bench. The lunge is a lower body exercise that works the quads, the glutes the hamstrings and the calves. 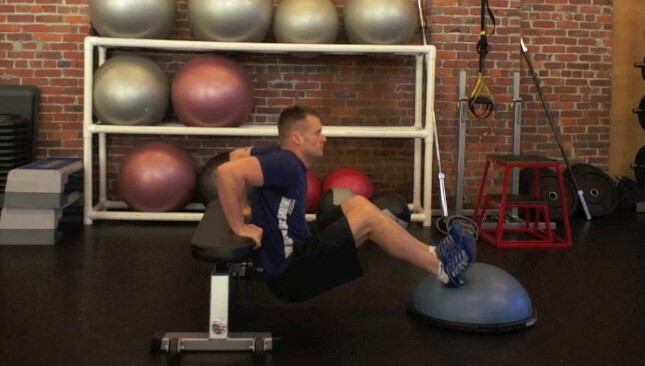 The supermans with a stability ball on the bench is an intermediate core exercise. 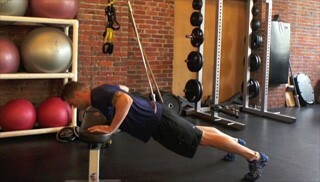 This exercise is performed on the bench to increase the level of difficulty. The stability ball is used to help maintain proper form. The double toe tap on the Bosu is an intermediate core exercise that helps to strengthen and improve core conditioning.